Citation: R.Akil Sindhu, R.Manicka Chezian. 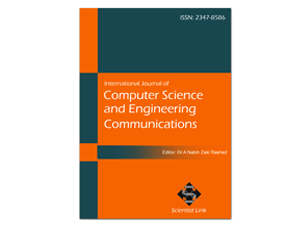 "Adapting Keyword Recommendation Approach to Folksonomies in Edu-AREA Using Hierarchical Classification" International Journal of Computer Science and Engineering Communications,Vol.4,Issue.2.(2016):1343-1350. Information and Communications Technology in e-learning domain is immensely growing which creates a new path to the development of Web applications supporting the reuse of Open Educational Resources in a collaborative environment. Current web offers various options to keep content and even generate it. The enhancement of Web 2.0 to Semantic Web brings innumerable applications and solutions to society. Edu-AREA is such a kind of Web 2.0 application focusing to provide teaching innovatively. Edu-AREA serves as referatory allowing users to register various resources, containing metadata and refers to them which are available in the external system. At the present stage of Edu-AREA enlargement, problem in managing the organization and classification of information, contributed by users is faced. To resolve this problem a Keyword Recommendation approach to folksonomies is proposed. As Folksonomy is a flat system, to provide a better implementation of folksonomy in Edu-AREA, this paper proposes a non-flat systematic and ontologically semantic structured folksonomy approach that can be processed with an efficient recommendation method and the recommended keywords are generated which are further applied with hierarchical classification technique applying C5.0 algorithm and highly relevant keywords are recommend for tagging the folksonomies in Edu-AREA. Tim O'Reilly,” What is Web 2.0: Design Patterns and Business Models for the Next Generation of Software.”,Communications & Strategies, No. 1, pp.17-35, First Quarter 2007. Available at SSRN. Manuel Caeiro-Rodriguez, “Opening Lesson Plans to Support Teaching Innovation and Open Educational Resources Adoption”, Proceeding OpenSym '14 Proceedings of The Symposium on Open Collaboration Internationa,l ACM New York, NY, USA , pp.47, 2014. Frederic Font, Joan Serra, “Folksonomy-based tag recommendation for collaborative tagging systems”, International Journal on Semantic Web and Information Systems, vol.9, Issue 2, pp.1-30, April 2013. Leandro Balby Marinho, Krisztian Buza and Lars Schmidt-Thieme, “Folksonomy-based Collabulary Learning “,Proceeding ISWC '08 Proceedings of the 7th International Conference on The Semantic Web, Springer-Verlag Berlin, pp.261-276, October 2008. Ivan Cantador, Ioannis Konstas, Joemon M. Jose, “Categorising Social Tags to Improve Folksonomy-based Recommendations”, Web Semantics: Science, Services and Agents on the World Wide Web, vol. 9, Issue 1, pp.1-15, March 2011. Stefan Siersdorfer, Sergej Sizov , “Social Recommender Systems for Web 2.0 Folksonomies”, HT '09 Proceedings of the 20th ACM conference on Hypertext and hypermedia, ACM New York, NY, USA , pp.261-270, June 2009. K. Schoefegger, P. Seitlinger, T. Ley, “Towards a User Model for Personalized Recommendations in Work-Integrated Learning: A Report on an Experimental Study with a Collaborative Tagging System”, 1st Workshop on Recommender Systems for Technology Enhanced Learning (RecSysTEL 2010), pp.1-10,2010. J.Trant, “Studying Social Tagging and Folksonomy:A Review and Framework”, University of Toronto / Archives & Museum Informatics, Journal of Digital Information, vol.10, No 1, 2009. Enrique Estelles, Esther del Moral, “Social Bookmarking Tools as Facilitators of Learning and Research Collaborative Processes: The Diigo Case”, Interdisciplinary Journal of E-Learning and Learning Objects,vol.6, Issue 1, pp.175-193 ,2006. Christian GLAHN, Marco KALZ, Marion GRUBER & Marcus SPECHT, “Supporting the Reuse of Open Educational Resources through Open Standards”, pp.308-315, 2010. Andreas Hotho, Robert Jaschke, Christoph Schmitz, Gerd Stumme, “FolkRank: A ranking algorithm for folks onomies”, UNIVERSITY OF HILDESHEIM, INSTITUTE OF COMPUTER SCIENCE, vol.1, pp.111-114, 2006. Zarli Htun, Phyu Phyu Tar, “A RESOURCE RECOMMENDER SYSTEM BASED ON SOCIAL TAGGING DATA”, Machine Learning and Applications: An International Journal (MLAIJ) vol.1, No.1, pp.1-11, September 2014. Mohammad Mustafa Taye,” Understanding Semantic Web and Ontologies: Theory and Applications” Journal of Computing, vol.2, Issue 6,pp.182-192, June 2010. Anurag Upadhayay, Suneet Shukla,Sudsanshu Kumar , “Empirical Comparison by data mining Classification algorithms (C 4.5 & C 5.0) for thyroid cancer data set”, International Journal of Computer Science & Communication Networks,vol.3, Issue 1,pp.64-68,2013.